Anthony DiFlorio has found a way to combine his love for storytelling and passion for food, getting first-hand experience in both industries as he seeks to combine them as a food critic. He is working towards his master’s degree in the Journalism and Digital Storytelling program at American University School of Communication (AU SOC) while helping one of DC's top chefs open a new restaurant. Why did you apply to the Journalism and Digital Storytelling program at AU SOC? I applied for a few reasons. First, it worked well with my busy schedule. I work an intense schedule at a cocktail bar so I’m able to go to school full time on weekends and still work nights at the bar. The program also offered diverse options. There is a robust set of courses that are skills focused and not theoretical. I wanted to learn skills – writing, photography, audio production, editing, and more. Working in a network of people and being taught by professionals and practitioners in the media is more valuable than learning just from scholars. Tell me about your experience working in the Columbia Room, which was awarded best bar in Washington D.C. in 2016 and 2017. I worked at the Columbia Room for a year and then I moved within the parent company called the Drink Company. I started as a bar back, and I didn’t even know that the Columbia Room had won best cocktail bar in America. I did all the dirty work as a barback, and it required a large knowledge base about alcohol and the history of drinking culture in DC. But, I got to talk to some incredible people within the company and eventually I was promoted to bartender. Johnny Spero, the chef at the Columbia Room, approached me and asked me to work at his new restaurant, Reverie, in Georgetown. 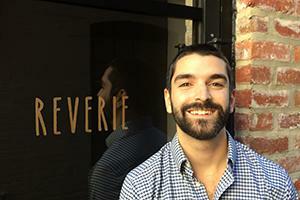 What was it like working with Johnny Spero to open his new restaurant? I just transitioned there recently, but Johnny and I are good friends and it’s great being able to work with him. He has opened my eyes to the food industry and I have found my passion for food through this experience. Evan Zimmerman, the sommelier and general manager, has taught me so much about wine, wine pairings, and the wine business. Spero offered to teach me anything I wanted about the upscale dining environment, and I’ve been able to take advantage of this opportunity and learn from one of the bests in the business. How has working in the food/ beverage industry impacted your journalistic goals? When I applied to the Journalism and Digital Storytelling Program at AU, I was already working in the restaurant industry but I had no intentions of becoming a food critic. I did one of my first journalism projects on the Maine Avenue Fish Market in Southeast DC. It is the longest running fish market in the country and has been open for more than 100 years. I learned so much about the human elements of food and learned that food is for the sake of people and not for the sake of food. After that, I did all of my projects around hospitality and food. That one story changed everything – I now want to make a living writing and creating media within the food, travel, and hospitality space. Why do you want to work at ZeroPointZero? ZeroPointZero has done more work for the food journalism space than anyone else and has promoted people more than food. Anthony Bourdain was a partner at the company and he focused on the people when other channels were focusing on the glamour shots. He wanted a human element and he wanted to use food as a medium to connect to other people. He inspired me to work there and continue on his work of focusing on the people. ZeroPointZero is doing innovative work and is carrying on Bourdain's Legacy.